An American Werewolf in London should go down as one of the best werewolf movies ever made. I certainly think it warrants this type of consideration. I had the pleasure of not only seeing it when it first came out but some years later reading the screenplay. I always give extra consideration to the writer or director who respectively pays homage in their movie to either an actor or a role they made famous. John Landis does this twice in American Werewolf in London by alluding to Lon Chaney, Jr and probably his most famous role, “The Wolfman”. Each time I watched this movie, and I’ve seen it countless times I still get creeped out when the lead character David and his good friend Jack fail to heed the advice of the group of towns people they met at the “Slaughtered Lamb ” who said to “stay to the moors and beware of the moon”. Of course what resulted from their “misstep” was one of the most terrifying horror movie scenes ever filmed. There were two things that made the scene so effective in my opinion. The first thing was that “bone chilling,” sound the werewolf bellowed coupled with the element of them not knowing what kind of animal it was, together I imagine shook the two characters to their very core. One more thing about the “Slaughtered Lamb”, as far as its name, could it be that John Landis decided to name the pub that because it was some type of biblical reference? Or was it because despite the two young men being warned, albeit cryptically, by the locals before they ventured into the night and their awareness of what awaited them out there and what would undoubtedly befall them if they failed to follow their directives, they would in essence be like “two sheep being led to the slaughter”? I obviously have no way of knowing if that’s what Mr. Landis was thinking when he wrote that into the script. But as you know, much of what is put in to a screenplay is done for subtext purposes. One thing I noticed that John Landis was able to successfully achieve in the opening sequence of this movie is kind of what Steven Spielberg was able to do during Jaws. And that was, he managed to convince us that getting into the water would not be in our best interest, if you get my drift? Every element in the sequence leading up to Jack’s horrendous mauling was designed to not only build tension but to convince us along with the two characters that something is out there, something with the worse of intentions. From the aforementioned mandate to the vast remote area they found themselves along with their sudden realization of their mistake of having strayed from the road, to the unknown significance of the full moon. 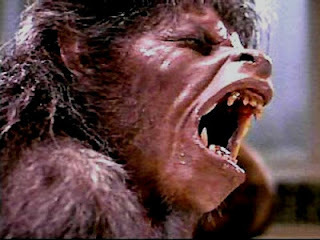 And as for the special effects, unlike the metamorphous that Lon Chaney went through in the movie The Wolfman, which was more creepy than frightening, when David Naughton’s character began changing into the werewolf his change, was unique from what we had seen of other werewolves on screen. John Landis wanted to not only put more emphasis on how his creature came into being as for the length of time it took and the details he wanted us to see, but he wanted to give authenticity to what he thought a human would experience if his body suddenly begun changing into something it was not physiologically programmed to be. If you can remember the character Eddie in “The Howling”, by the way, another favorite werewolf movie of ours, as his body started to morph and his clothes started becoming 6 sizes too small, such as when he began growing extremely tall? Well the director didn’t understand what John Landis clearly understood about what such a change would do to a man’s pain threshold. He knew it would push it to the limit and that’s why he made sure that as David Naughton began taking on the appearance of the werewolf he would not only do it to pain-staking detail but also in excruciating pain. There were a few things, however, I didn’t like about the movie but they were small things. The first thing was John Landis’ decision to include a love interest. Certainly none of the other werewolf movies had the element included in their story and their stories didn’t suffer from it. Maybe its inclusion was for the purpose of elongating the story so that the script would meet the minimum length requirement that each Hollywood script must meet. That certainly is a possibility. Don’t get me wrong; the woman who played David’s lady, Jenny Agutter, isn’t hard on the eyes and seemingly gets prettier with each viewing of the movie. Secondly, each of those weird dreams David had throughout the movie. It doesn’t matter how many times I see the movie their significance doesn’t fail to escape me. Notwithstanding the minuet things I didn’t particularly care for about An American Werewolf in London it still remains one of the best werewolf movies every made and a personal favorite that every horror movie lover should have included in their cherished horror collection.